Oppressive. Dull. Blunt. Force. 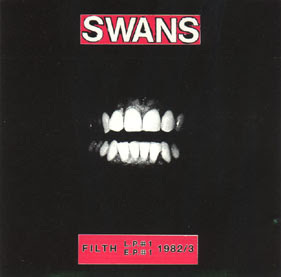 The first SWANS LP just suffocates. Everything: from Gira's minimalistic and accusatory lyrics- to the death-march pound and scrap of the music- to that cover art. Teeth suspended in a total void. Chewing the weak flesh that hangs off the skeleton of the outer world. Eviscerating the pathetic inner world populated by the heart's delusional desires.